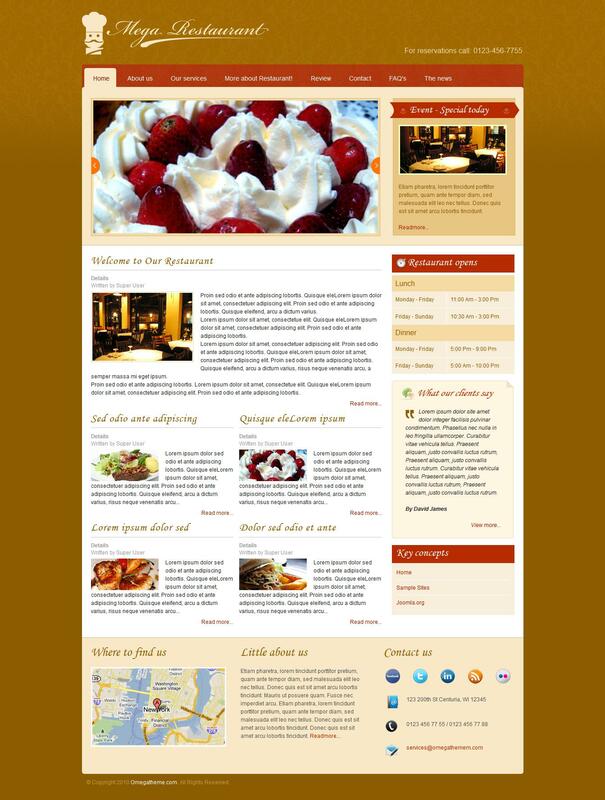 OT Restaurant - attractive and functional template from the popular design studio OmegaTheme. This template has a professional layout and layout is perfect for creating websites of restaurants, cafes, eateries, blogs to accommodate a variety of recipes as well as services that offer food delivery to your home or office. Template perfectly adapted to the social network, uses visual and functional slider image rotator, and also has a fast loading pages. Powered by a flexible platform studio Solid Framework, contains more than 12 module positions, optimized code files for search engines, and is fully compatible with all browsers and versions of CMS Joomla 1.5 and 2.5. The archive contains all the additional extensions that provide a template with all necessary functions.